From the first days of beginning Touch A Life we have had mixed emotions; bittersweet moments at each meal when we observe happy, smiling faces of children enjoying their meals, so generously provided by their sponsors. If you stand back and watch as they eat their eggs and hot dogs or rice and beans and tortillas or spaghetti with meatballs, you can see them raise their hands and receive a second or third helping of food. They can have all they want, and month by month you can see them grow larger, stronger and healthier. Then there are those children who do not sit at the table; they stand back and watch while others eat but have nothing for themselves because they do not have a sponsor. You see a different look on their faces. Let me draw your attention to the photo at right. Look at the condition of the boy in the white shirt standing in the back. He is thin, weak, and undernourished. Look at his face. He is not smiling. He is hopeless and holding back the tears. 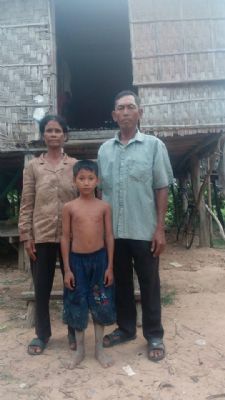 He has waited for months and still has no sponsor to care for him and there are twenty more in his village just like him. Each day mothers come with their unsponsored children and stand, waiting for hours if necessary and when the meal is over the cooks take whatever food is left and serve it to as many as they can who are waiting for the scraps. On this day after the meal was served, the children went into the church building to sing for the group from America that was there with me. 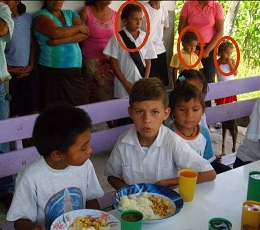 Once they were inside the cooks began to scrape off the plates and made three bowls of food for the three children (circled) who were there that did not have sponsors, including the boy in the photo. I stood aside and watched in amazement as they began to scarf down the food using their fingers to scoop it with. They didn�t wait for a fork or spoon. Their hunger was too great. When their bowl was empty they picked up individual grains of rice from off the table to eat them as well. We invited sponsors who could afford it and who felt a desire to do so, to occasionally donate funds to buy a large bag of rice or beans so that we could get it at a cheap, bulk price. A 25 pound bag of rice is only $20 and a 25 pound bag of beans is $34. This large amount could then be cooked and fed to children who have no sponsor so that they do not go hungry while they wait to be sponsored. I made up a one page letter to send out with the receipts to the sponsors of our children and in the following month, nearly $1000 was given. We sent well over half of it to India where it has been used to feed over 200 children daily and the rest went to Honduras; enough to feed at least 100 children daily. Of course this was not a sponsorship. There are no photos, no letters, no sweet little �thank you� notes, etc. Just the reality that you are putting food into the hungry stomachs of little children who are being fed and cared for in a local church and hearing the Gospel every day. We fully understood this was not a monthly commitment on the part of those who gave, at least if it was I didn�t know about it. I told our kitchen directors to make it go as far as they can because I don�t know what if anything will be donated next month. And I guess that is the reason for this article. We have determined, since the launching of this concept was so well received, that we would give this project a name and hope that some of you would give to it on a monthly or regular basis. Many who are sponsors may want to give a little extra and those of you who are not sponsors because you cannot afford the $35 a month it requires, may find you can afford $6.50 a month for this bare bones feeding program. So if that is you, we welcome you as a member of our newest ministry, apply named by my daughter Sara as Daily Bread. That is after all what our Lord taught us to pray for, so we find ourselves again in the unique position of being God�s answer to their prayers. How neat is that! We collect the funds and distribute them around the world to our centers. They buy the food in bulk prepare it and feed the kids. (Not just rice and beans but that is the staple. We�ll give them meat and vegetables too.) Most of the $6.50 is used on the food but we also have to pay the cooks, buy the cooking pots, etc. A report and photos will be sent to us by the Directors which we will use to report to you in each issue of the Progress Report. That way you will see your funds being used in India, Honduras, Ghana and beyond. Of course the whole idea of this is to be able to purchase food in bulk and in doing so, get more bang for the buck. Maybe you just want to help with that and don�t want to commit to a monthly amount. We have looked at the prices around the globe and come up with an average and have listed it here for you. So whether you want to help on a monthly basis or help with a specific on time donation, please just help. Our commitment to you is that we will use the food to care for children who have lost their sponsor or have never had one. They will be fed good, nutritious food as a ministry of a local church under the supervision of a pastor who will assure that each day when they come to eat they will hear God�s Word and learn Christian songs and Bible verses. We will report to you through the Progress Report how many are being fed, what countries they are in and provide you with testimonies and photographs to verify that we are doing as we say we are doing. We appreciate your partnership in this new and needy venture.